In all the business and bustle of last minute Christmas preparations… take a little break with me and I’ll share a spot at StoneGable made to evoke calm and serenity..
I’ve been fluffing… putting the last minute touches on our bedrooms… getting them ready for a house full of family! Here is the J&J room. My daughter Jacqueline and her husband Jonathan stay here when they visit. It has the “calmest” decor in my whole house. 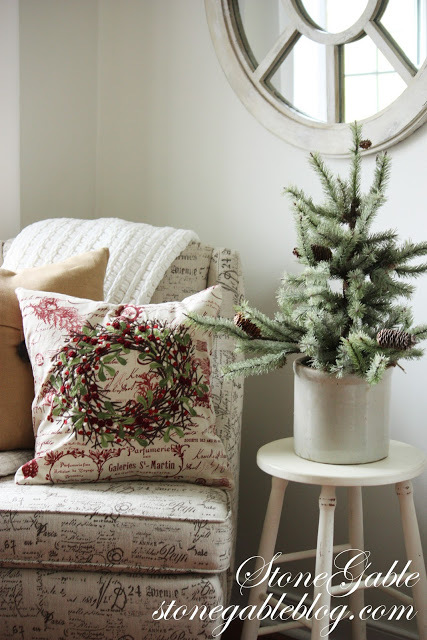 I just added a couple of very simple decorations…to celebrate the season, but not to clutter the room. Early morning light streams through the windows and give the room a fuzzy, soft feel. I’ll put two small presents under this little frosty tree for Jacqueline and Jon to open before they come downstairs Christmas morning. Every years since Jacqueline was born I have gotten her an ornament… one that symbolizes something about her life. 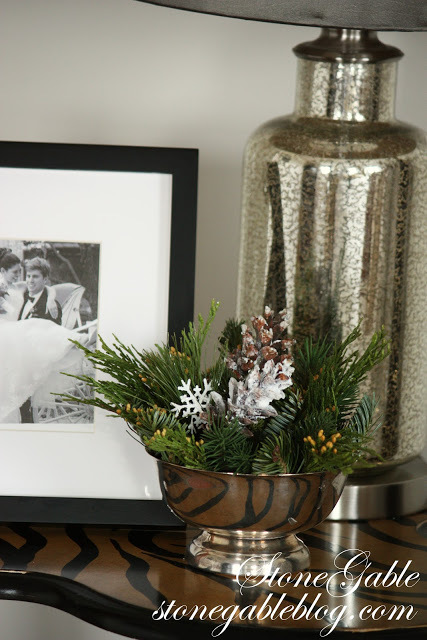 They will have fun opening their ornaments together… a little private Christmas moment for the sweet couple. 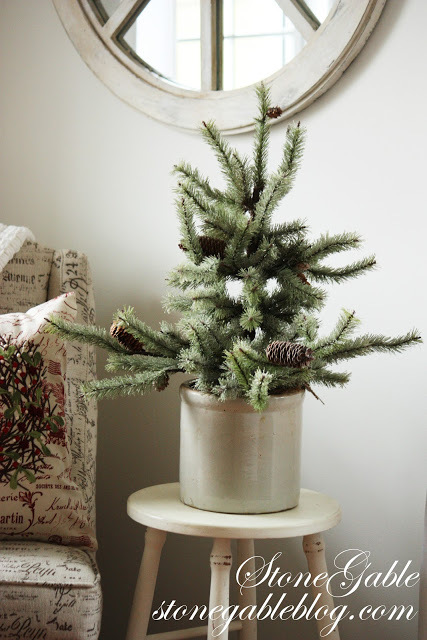 The tree sits in an antique crock. These old crocks are plentiful in my area. 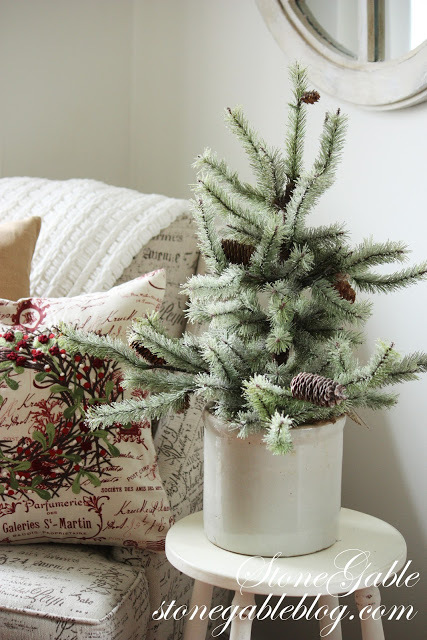 I thought it would be perfect for the little tree. 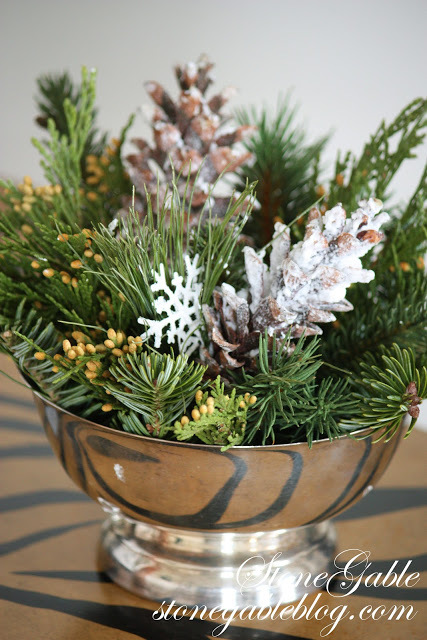 Across the room, next to the bed I added a little silver bowl of live greens and snowy pinecones. 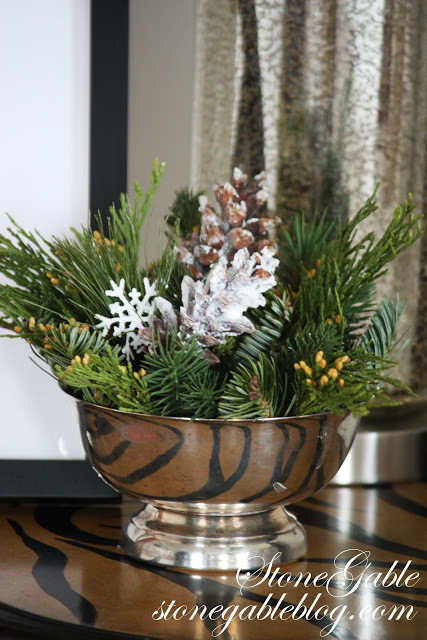 The bowl picks up the reflection of the zebra striped table. I added frazer fur, incense cedar and white pine to the bowl. White pinecones were sprayed with “snow”. I hope this post brings calm and joy to your life today!!! You are the greatest of hostesses!…beautiful touches to make anyone feel welcome! A beautiful,fluff job! Happy Holiday, Yvonne! A beautiful room for a beautiful couple!! 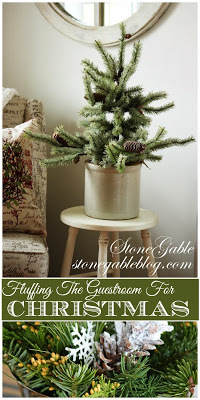 !….Merry Christmas to you and your wonderful family Yvonne!!! What a beautiful Calm room, Looking forward to you Sunday Scripture. Merry Christmas Yvonne! This is beautiful! Merry Christmas to you and yours! All is beautiful Yvonne. Merry Christmas! Beautiful Yvonne! 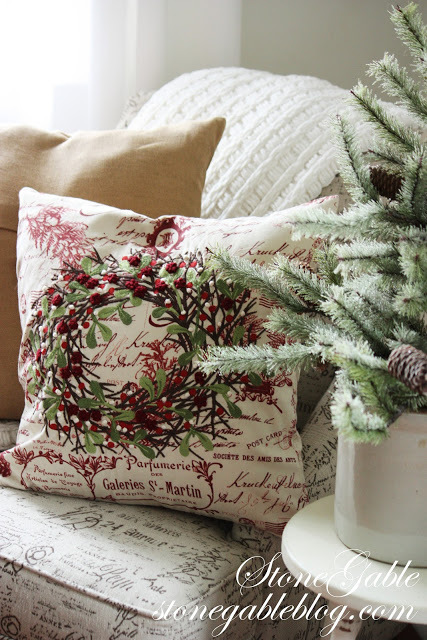 I keep chanting “All is Calm” to myself over & over but it’s not working 🙂 Love your soothing palette with the little bit of red from your wreath pillow! 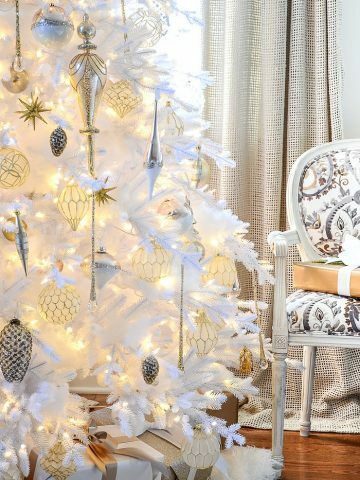 Wishing you and your family the Merriest of Christmases! 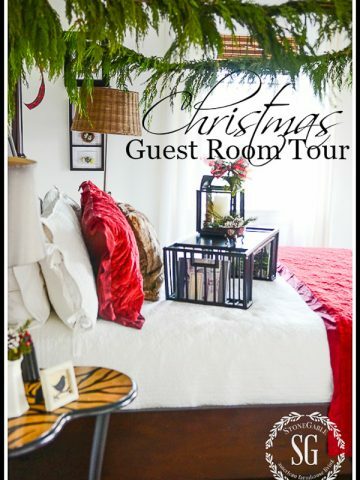 Looks like your guests are going to be in a perfect guest room….be careful they may not want to leave lol! I love all your beautiful special touches…..they mean so much to a visitor and it has such an elegant and serene feeling. Wonderfully done Yvonne! Lovely room, perfect pairings, sweet people. What more could one ask for? 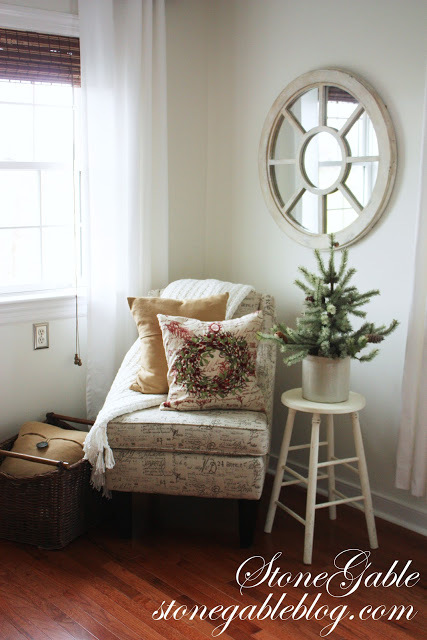 I am moving, (and, yes, I mean now – at Christmastime) and I have a guest room in my new house, I think mine will be simple & lovely, like yours, too. Calm, peaceful…..perfect. I have read your blog for sometime now, and it is a must read, thank you. 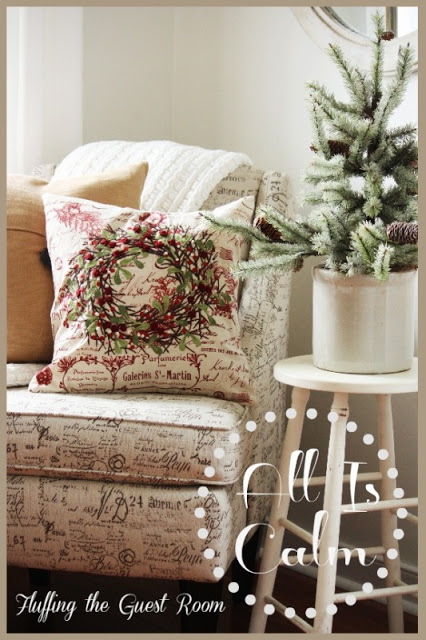 Can I ask what fabric was used on that sweet pillow? Or did you buy it? You definitely created a calm and lovely room for your daughter and SIL. 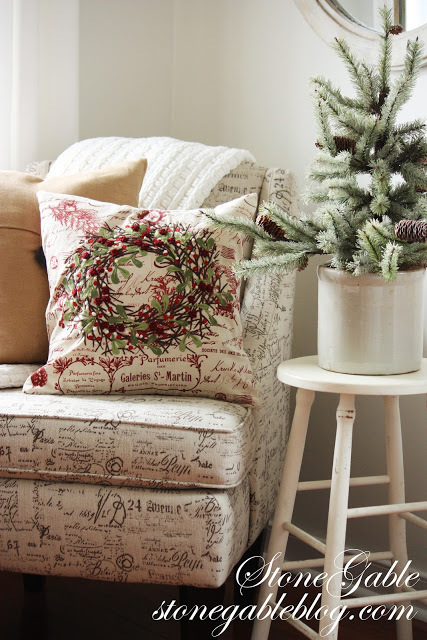 I love how you know exactly when to add and when it’s enough when fluffing a space. I love the pillow!! It would fit so nicely in my guest room. Merry Christmas!! So very pretty Yvonne. Calm and bright. What a wonderful room to stay in, I’m sure your daughter and her husband will love it. I assume that wedding picture is of them – such a nice personal touch. Merry Christmas. What an inviting room to visit in! All of your touches are so pretty. 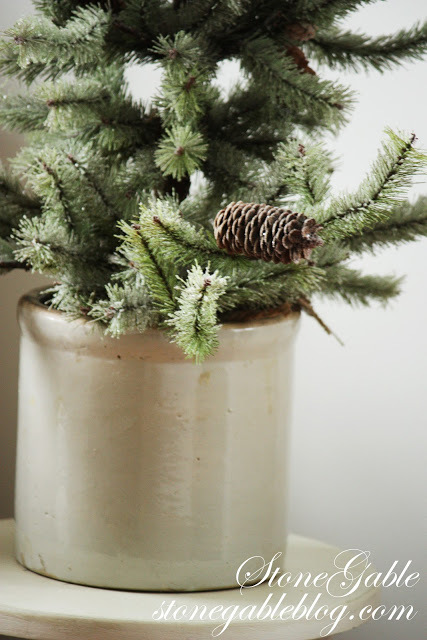 Love the little tree in the crock. Lovely touches in the guest room! I’m sure your daughter and son-in-law will love it. 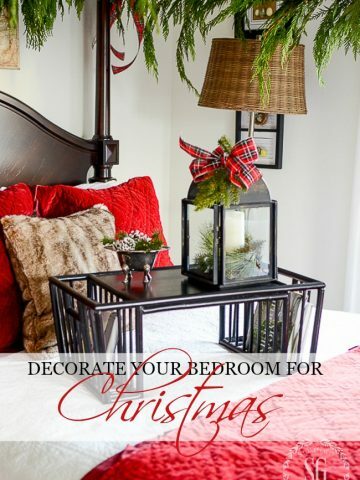 Such sweet Christmas touches in your guest room! I’m sure your family will enjoy it! 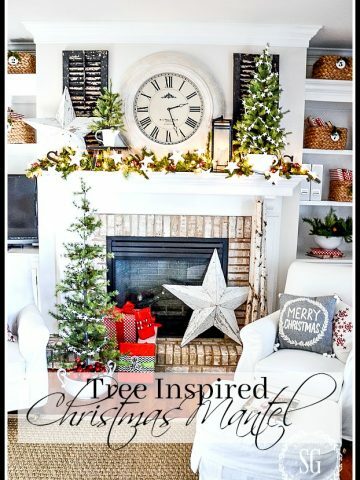 I want to thank you so much for the sweet comment you left me on my Christmas home tour post. You are such a talented decorator and your words really meant a lot to me! I hope you and your famiy have a very Merry Christmas!! Absolutely gorgeous. I am an “M,” though, may I still come stay in that awesome room? I would love to have you come ANYTIME, Michele!!! REAlly!!!! What a wonderful roomscape-a perfect place to nest while visiting! Very beautiful Yvonne! I especially love that pillow! Have the most wonderful Christmas ever! What a darling resting spot. It is just perfect for guests! I just love the chair and the pillow, and I am a big fan of crocks too! A little does go a long way… here’s to a beautiful and calming room. What beautiful touches you added. Your daughter and son in law will love what you have done just for them. May you have a beautiful joy filled Christmas. I love it! Especially the pillow. What a gorgeous guest room! Joy and peace did this post bring!!! Banana bread is baking to take to a precious friend this afternoon! Then the last few presents to wrap…and time to reflect on the coming celebration of our Savior’s Birth!!! Life is Good On Crooked Creek!!! Sooo pretty! Wish I were your guest! Have a very Merry Christmas and happy, healthy, new year! Stunning as always my friend!! Merry Christmas to you and your family!